The last weekend in July is as chock full of fruit and vegetables as the first, so head on out to get some of the season's hottest picks: tomatoes, potatoes, cucumbers, eggplant, and even some garlic! 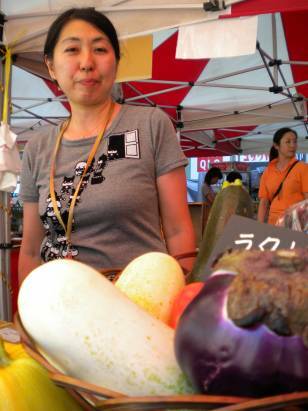 Photo: Chiba-san from Cosmo Farm hosts an array organic vegetables at Kinshicho Farmers Market. Where's your favorite place to find fresh vegetables and fruit? Give me a shout and we'll spread the word! If you fancy a trip to London then boroughmarket.org.uk is the best market in the whole world (well I think so) Lots of free samples and lots of food and veggies from all over the world. Oh, many thanks!! The hours look quite doable, and that's one of the most comprehensive websites I've ever seen. Wow.